Today I would like to share with you the Singaporean version of “American Idol”. You know, the TV singing competition, where the winner gets to record a new album and be famous? The show was locally adapted in many countries, including in Singapore. 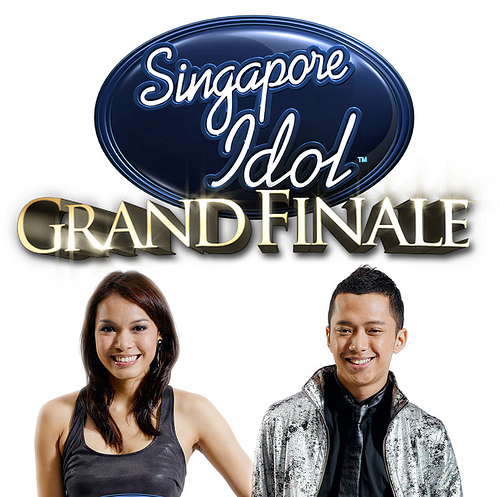 Sylvia Ratonel and Sezairi Sezali, finalists in the 2009 season. Sezairi Sezali won with 61% of votes. 3 seasons were broadcasted on Mediacorp, in 2004, 2006 and 2009. Candidates came from various backgrounds but were all determined to try their luck to break through in the competition. And as usual, the jury was delighted to make crisp comments on each of their performances!! I hope you can manage to understand their Singlish accent 🙂 What strikes me most is, as mentioned in the video, problems some candidates have with bad diction. Maybe this is one of the results of being part of a culturally and linguistically mixed-up environment! And to end on a positive note, this one REALLY makes me laugh a lot !! It was during Singapore Idol‘s first season.